We just learned about the Golden Madonna of Essen. Another ancient sculpture is the Gero Cross, carved around 965 AD. This crucifix is over six feet tall, and is made out of oak wood, painted, and gilded with some gems. 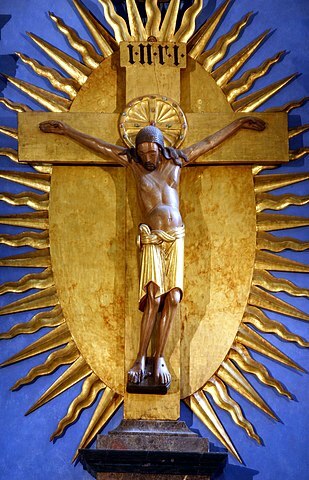 The oval and sun rays behind the crucifix were added about 700 years later. It is different from other sculptures of the time, because other crucifixes showed Christ alive with his eyes open looking out. This crucifix shows him after he died on the cross, looking sad. Many other crucifixes made after this one copied the same style.